The FBI presented tweets from alleged bomber Dzhokhar Tsarnaev during testimony concerning the Boston Marathon Bombing on Monday. Prosecutors alleged that the tweets provided a timeline of the defendant’s radicalization. 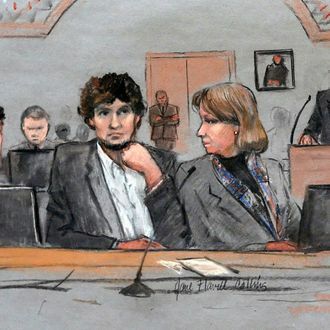 On Tuesday, defense attorney Miriam Conrad questioned the FBI’s research of the context of much of Tsarnaev’s social-media usage; it turns out that the FBI agents in the courtroom weren’t too well-versed in the pop-culture references they hoped would help the prosecution. Conrad asked about another tweet that was highlighted in Kimball’s testimony, in which Tsarnaev referred to a story about a man crying at the BostonMarathon as being fake. The FBI also made a few other errors in their analysis of the tweets, which came from one public and one private account used by Tsarnaev. The defense team began the trial by admitting that the defendant was guilty of the bombing; they argue that his older brother’s influence led him to take part in the bombing — which could possibly make a death sentence less likely. Evidence from the boat where Tsarnaev hid from law enforcement was also presented on Tuesday. Messages written on the side of the boat were riddled with bullet holes, as you can see from a transcript of the messages published on CNN. I’m jealous of my brother who ha (bullet hole) ceived the reward of jannutul Firdaus (inshallah) before me. I do not mourn because his soul is very much alive. God has a plan for each person. Mine was to hide in this boat and shed some light on our actions. The US Government is killing our innocent civilians but most of you already know that. As a (bullet hole) I can’t stand to see such evil go unpunished. We Muslims are one body, you hurt one you hurt us all. Well at least that’s how muhhammad (bullet hole) wanted it to be (for)ever.